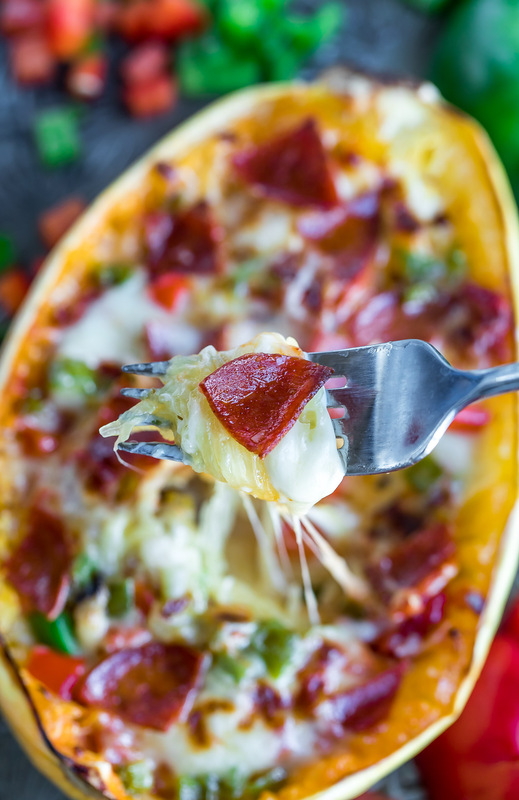 Whip up these Veggie Lovers Spaghetti Squash Pizza Boats for a low-carb + gluten-free pizza night of epic proportions! Though my college and nutrition counselor days are far behind me, I still have a dietitian’s mindset when it comes to labeling things I eat. Classifying foods as “good” or “bad” doesn’t hold much water with me. If we’re talking about artificially concocted franken-foods, however, then that’s an entirely different story. That trash doesn’t get to parade around like it’s hot sh*t, no way. But that’s another story for another day! When it comes to my recipes, I don’t like to pidgen hole them with such polarity. I feel like since they’re all from scratch and made with love/whole foods/real food/etc… that factor alone makes them healthy. Makes sense, right? Let’s cut ourselves some slack here. These pizza boats for example, are anything but trashy! You’ll frequently find me pizza-fying everything from bell peppers to zucchini. They’re gluten-free, super tasty, and help me get my daily fill of veggies. Win win winny win. 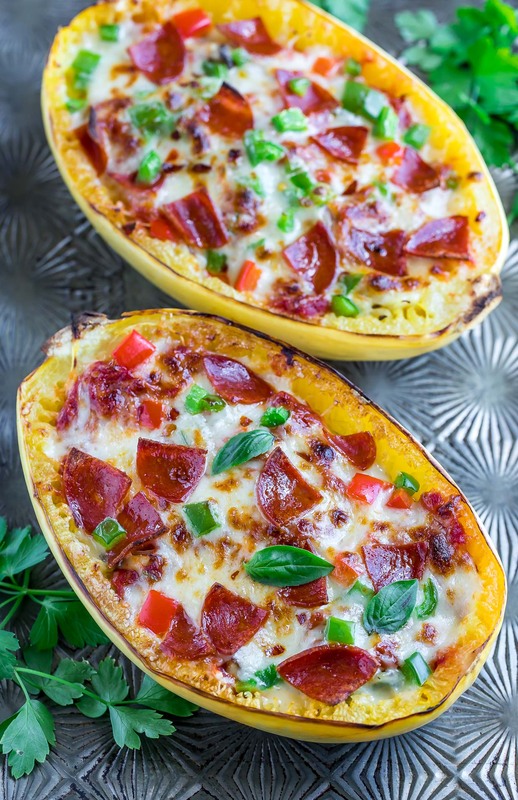 These Veggie Lovers Spaghetti Squash Pizza boats are a welcome new addition to my weekly pizza fix rotation and are GREAT for those who may have dietary restrictions of the low-carb, gluten-free,or kept variety. You can use regular, turkey, or vegan pepperoni or simply add some extra sautéed veggies instead! Hellooooo delicious! 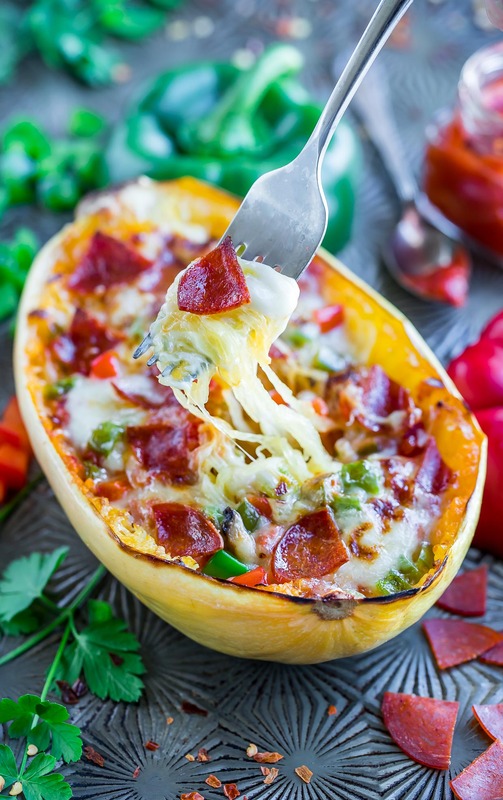 These easy cheesy pizza boats are easy to customize with all your favorite pizza toppings! Mix some into the squash and save some for sprinkling on top for a pizza topping extravaganza of epic proportions! Aka it’s delicious and you should totally make one now! I used equal parts chopped bell pepper and chopped mushrooms - delicious! If you're having trouble cutting the squash, feel free to stick each squash in the microwave to soften it up just a tad. Pierce it a few times with a knife (to help vent so it doesn't burst) and cook for for 3-5 minutes. The knife slides through way easier this way! Smaller squash will need about 3 minutes while larger ones will be good after at 4 min or so. Next grab a lipped baking sheet or a baking dish. Rub the cut side of the squash with a teeny bit of olive oil and place on your baking dish/sheet and roast face-down for about 35 minutes, or until tender and easily pierced with a fork. Cooking time will vary a bit depending on the size of your squash, and larger squash will need to roast a bit longer to tenderize. Once ready, the once rock-hard exterior of the squash will be visibly softened with a tender interior. While the squash roasts, chop all your veggies and portion out your toppings + sauce. You can use raw veggies in your squash if you prefer the crunch, but I like to lightly sauté mine. Heat a pan/skillet to medium-high heat and sauté your veggies in a drizzle of olive oil, adding the garlic towards the end to prevent burning. Once softened, pat dry with a paper towel and season with Italian seasoning blend, salt, and pepper. Stir in 2 TBSP of sauce and 2 TBSP parmesan cheese to each squash boat along with several spoonfuls of veggies. When it comes to extra sauce, veggies, cheese... have at it yo! I tend to overstuff mine. Top with remaining veggies/toppings, mozzarella cheese, pepperoni and finish off with a sprinkle of red pepper flakes for a kick. Switch oven to BROIL on HIGH, place squash back on your baking sheet/pan and broil until hot and bubbly, about 4 minutes. Keep an eye on it so you can yank at your perfect degree of golden cheesiness. I chose to chop my pepperoni into fourths because I love having a little bit of pepperoni in every bite. Feel free to follow suit! Need to make this 100% VEGAN or VEGETARIAN? It's super easy! Simply skip the pepperoni (or opt for a yummy vegan variety - there are a few good ones out there to choose from made with tempeh/tofu) and, if needed, replace the cheese with your favorite dairy-free shreds. No pizza sauce? No problem! I made my own pizza sauce using my favorite jarred spaghetti sauce and some tomato paste to thicken it (if sauce is watery your stuffed squash will be as well) - regular spaghetti sauce will work in a pinch but may be very watery. 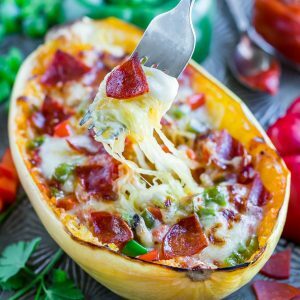 If you're using that instead you can warm it up and add it to the squash as needed after stuffing it with cheese/veggies/toppings. 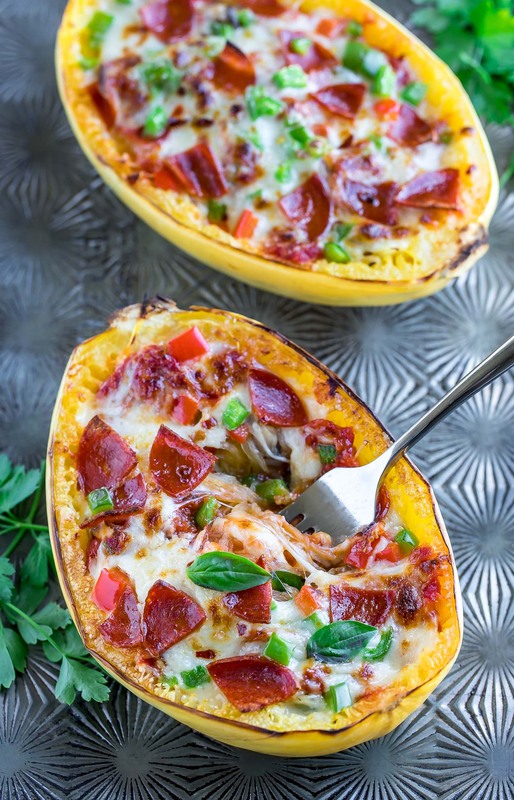 If you get a chance to try these easy cheesy Spaghetti Squash Pizza Boats, let me know! You can leave a comment here or tag me with @PEASandCRAYONS #peasandcrayons so I can happy dance over your creation! Can’t wait! Cheesy Garlic Parmesan Spinach Spaghetti Squash READER FAVORITE! Awesome, love these veggie recipe! Can’t wait to try this for the kids. Thanks! My husband said he was craving pizza. We have started a new healthier lifestyle so when I ran across the recipe I thought perfect. I sautéd all of his favorite vegetable toppings and added them to the “pizza”. The only thing he said he would do differently would be to add a tad more sauce. I liked it the way it was. The great thing about this recipe is you can easily personalize it! OMG these look so COZY and delicious. I must try this one. LOVE your gooey-yummy photos! 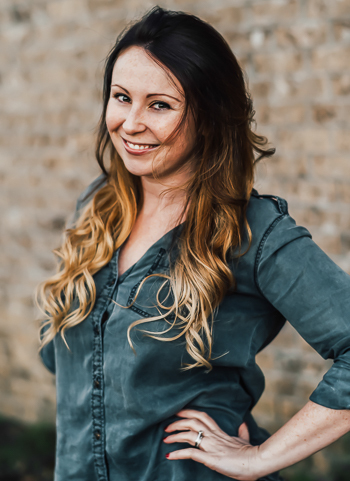 Hi Jenn, This looks good! Since you love pizza-fying veggies so much, I thought I’d share one of our personal faves… we call it portabella pizza. Take a large portabella cap and add sauce, cheese, and other veggies (red bell pepper is a must for us) into the cap. Bake until portabella is tender and cheese is bubbly. I tend to go a little lower on the oven temp (350 to 375) to give the mushroom cap enough time to get tender and dehydrate a little without browning the cheese too much. 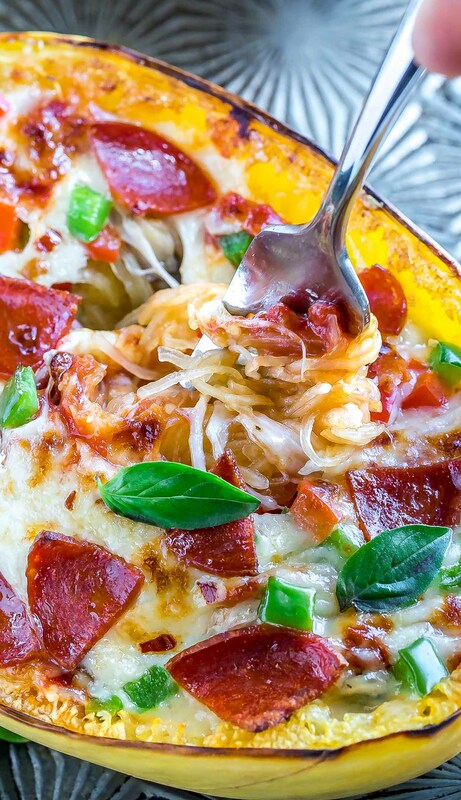 It’s like a little personal pizza that is low carb and delish! I haven’t tried this, but I think using smaller mushroom caps would make a nice appetizer! Feel free to make this concept your own and create a future Peas & Crayons recipe if you like. As always, I enjoy your interesting and healthy creations! Loooooooove me some portobello pizzas! I used to have a recipe on here but the photos were so atrocious I removed the post and wanted to wait until I had a chance to take a proper photo with natural lighting. I haven’t tried them with red pepper but I bet it’s delicious with a boatload of veggies all in on the mix! Have you tried it with spinach yet? SOOOOO GOOD! Love your idea for little mini mushroom cap pizzas, how awesome would those be for game day or a party? Love it so! I love spinach and mushroom pizza but oddly enough haven’t tried it with the portabellas! Great idea! Will definitely try it next time – somehow they go together. I think a little feta cheese would go well with that combo. Next time the portabellas look good in the grocery store, I’m definitely going to give that a try.